Top tips from meat expert and cookbook author Bruce Aidells. 30 years of sausage making has left Bruce Aidells, author of 11 cookbooks, including The Complete Meat Cookbook, and a contributing editor here, with a solid understanding of how flavors work together. Bruce gave Associate Editor Carolyn Malcoun the lowdown on how to make the best possible burger. And we’re sharing his secrets with you. CM: What do you think the secrets are to a tasty burger? BA: Number one is using good-quality meat—you can’t make a good burger using inferior ingredients. Then you need an understanding of how to flavor meat. My burgers are not only flavored with spices, but with other ingredients like cheese, onions and olives. You also need to mix the seasonings into the meat itself rather than just sprinkling them on the outside. CM: Where do you get the ideas for such unique flavor combinations? BA: I think I have a really good knowledge of spices because I’ve cooked food from all over the world. Living in large metropolitan areas, like London and San Francisco, has exposed me to a lot of authentic ethnic food. My Spanish Pork Burger benefited the most because I had just been to Spain so those flavors were really fresh in my head. I seasoned the burger itself with Manzanilla olives and Pimentón de la Vera, then topped it with Manchego cheese. A little saffron stirred into the mayo adds color and another element of flavor. 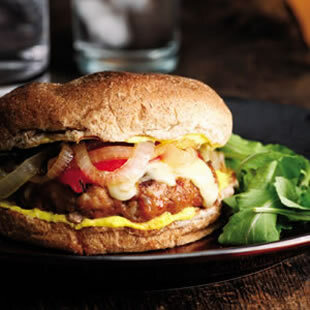 CM: You’re not known for healthy recipes per se…what challenges did you have in making healthier burgers for EatingWell? BA: Well hey there [laughing]! It depends on how you define health. In terms of lowering fat, the same tricks I used when making sausage apply here—so how do you make a leaner sausage without it being dry and horrible? You have to add other ingredients that add moisture. Because fat is your major flavor component and adds texture, it make things juicier. But you can do other things to accomplish that, like incorporating onions or peppers to add flavor and moisture. The other thing is you need to be careful not to overwork the meat. Overworking it exacerbates the dry, rubbery quality—you should mix it just enough to homogenize the seasoning. CM: One of the times we tested the Hanoi-Style Tuna Patty Salad, the burger was dry—and we thought it had been overprocessed in the food processor. We ended up hand-chopping it so home cooks would have more control over the end result. BA: You hit the nail right on the head there. And tuna would be the worst because it’s very lean; the fat that is in tuna is very well incorporated, they don’t have a subcutaneous fat layer like mammals do. Coarsely ground meat is the best, because bigger particles of meat hold their moisture better. If you really grind the hell out of something, it gets really dry. CM: Do you have any other tips for cutting fat? BA: Turkey is a great way to add a fairly neutral taste to fattier cuts like lamb without affecting the flavor, like in my Turkish Lamb Pita Burgers. CM: Chicken and turkey burgers are often leaner, but not very visually appealing. If you’re making burgers with white meat, how can you make them look prettier? BA: Using paprika and ground chiles, or a lot of cilantro, parsley or other herbs can give color to a white-meat burger without overpowering the flavor. In Mozzarella-Stuffed Turkey Burgers, I added scallions and oregano for some color. Smothering them in fresh marinara sauce doesn’t hurt either. CM: What do you think about grass-fed beef? BA: I don’t try to compare grass-fed beef with dry aged prime, and sure, I prefer the fattier stuff, but I just look at it as another alternative, like eating lamb versus beef. It’s just a different flavor, a different meat that needs to be handled in a different way. I think when you approach it that way and don’t try to do your standard beef recipes, you’ll get good results. CM: What do you think the best burger toppings are? BA: I’m a cheeseburger guy. I do draw the line at Velveeta, though. Or American slices. I’d rather not have that. My favorite cheese is a nice aged Cheddar. I love the Thousand Island-type sauces that I grew up with in Los Angeles. Add thinly sliced sweet onions and tomatoes if they’re in season. I’m not a big fan of pickle relish but I don’t mind sliced pickles on a burger. The one thing I don’t like on burgers that I like on other things is mustard—it overpowers everything else and all you taste is mustard. CM: How do you cook the perfect burger? BA: I like to get a good sear on it. It’s hard to beat a grill for burgers—I like the smoky flavor it adds. But I’m not opposed to pan-grilling in a cast-iron frying pan, which is my favorite pan to cook a burger in. The biggest thing people do wrong when grilling is to cook over a huge open flame. You never want char. We’ve all had burgers that are burnt on the outside and nearly raw inside. You have to learn how to control the heat, and grill with various intensities of heat, so you can move the meat around. CM: If you had to eat a fast-food burger, where would you stop? BA: [Silence] I’d have to be awfully desperate. [Laughs] Even when I drove across the country with my wife, Nancy [Nancy Oakes, chef at Boulevard Restaurant, San Francisco], in 2001 I think I pretty much avoided all the fast-food places. Um, you know, I don’t have an answer! The last time I was in McDonald’s was 1962. [Laughs] I grew up in Los Angeles, and there’s a famous place there that I love called Apple Pan. That’s where I got the idea for my Smoky Bison Burger—it’s a riff on their hickory burger. CM: What’s the best burger you’ve ever had? BA: I gotta give my wife credit for the best burger I’ve ever had. Number one, she used really great beef, it was Wagyu [a breed of cattle whose meat is intensely marbled]. The bun was from a small, local bakery. And it had homemade mayonnaise and really great aged Cheddar. It wasn’t exotic but everything was as good as you could get, you know?